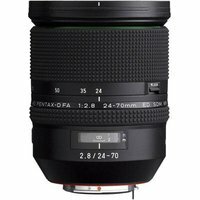 The Pentax 24-70mm f2.8 HD ED SDM WR zoom is a full-frame lens with weather-proof construction designed for a variety of applications, such as weddings, portraiture, sports, nature and travel. The lens features a bright, constant f2.8 aperture to ensure exceptional image quality throughout its versatile focal range and a stunning bokeh (defocus) background effect. The built-in SDM (Supersonic Direct-drive Motor) provides quiet, high-speed autofocus operation.